Diagrams that define or lay out the foundations of a process are essential for maintaining a strict organizational standard. 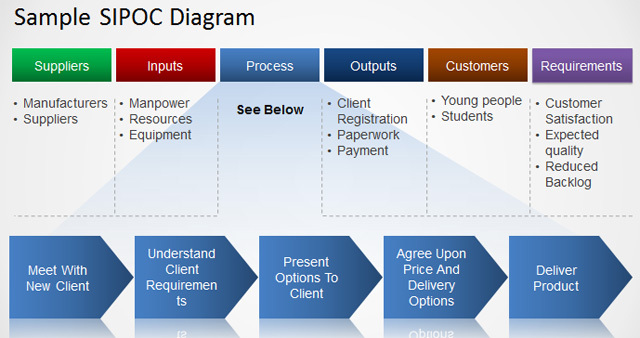 One such diagram is SIPOC, which defines one or more process, right from the suppliers to the customer. All of these five components are laid out in the form of a diagram as different columns of a table. As SIPOC is primarily meant to address customer satisfaction, it is also known as COPIS, where the information in the table is populated starting from the customer to the supplier. SIPOC was used also in the era of the Total Quality Management programs and can be a product of other process improvement initiatives like Kaizen, which is a Japanese philosophy for improvement. 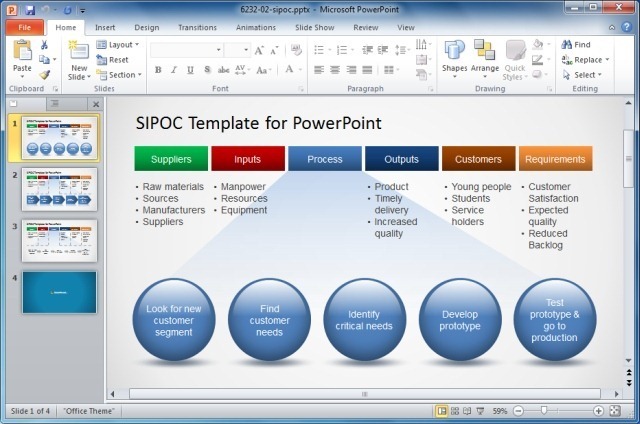 One of the easiest methods for making a SIPOC diagram is to use a readymade PowerPoint Template. 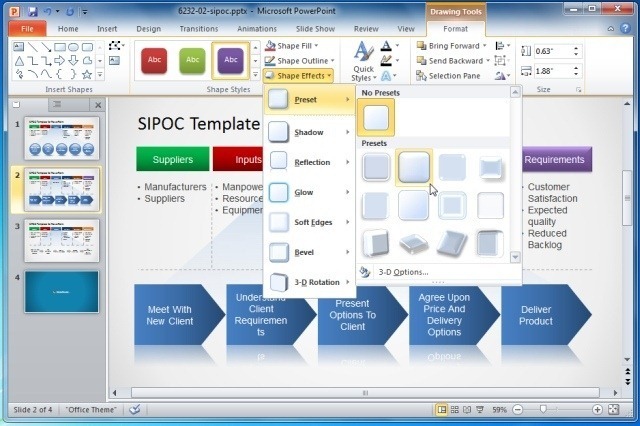 The SIPOC Template For PowerPoint is one such template which lays out different sample diagrams to help you quickly generate SIPOC tables by populating relevant fields. This template is quite easy to edit and merely requires populating your own bits from one or more process to generate a SIPOC diagram. The template offers three different designs for making your diagrams and you can edit out any part of the template by simply clicking on the given text-boxes (to add your own text) or by inserting additional placeholders; to add images, clipart or text. Using various built-in PowerPoint editing options you can further enhance the look of your diagrams, such as by making use of the PowerPoint Drawing Tools (as shown below). 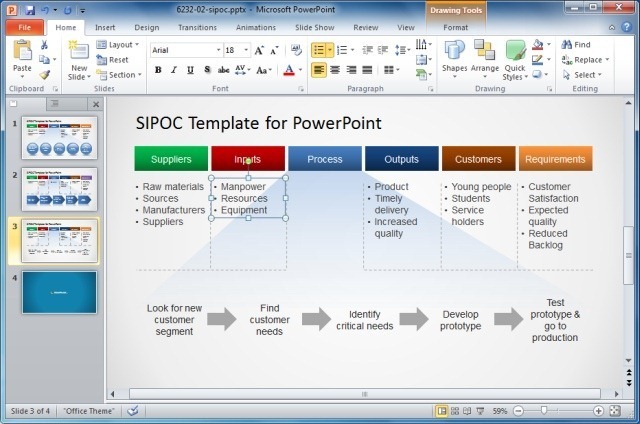 The below image shows a sample SIPOC diagram generated using the SIPOC Template For PowerPoint. 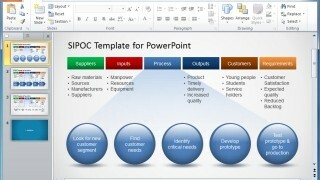 You can download this template by signing up for a Slide Model subscription, which will give you access to countless professionally designed PowerPoint Templates for making diagrams and presentations on topics as diverse as business, science, engineering, manufacturing, architecture and the like. Tags: Analysis Templates, SIPOC, SIPOC Diagram, Six Sigma.